The main objective of Rotary is service, in the community and throughout the world. And the Rotary Club of Cameron Park is dedicated to beautifying and making their neighborhood a better place to live. Celebrating its 40-year anniversary, the Cameron Park Rotary’s 70 plus members have been involved in numerous service projects. From the early years, the club wanted to change young lives, and hosted youth exchange students each year. Since then, the group has hosted kids from Australia, South Africa, Argentina, and many other far-flung locales. In addition to inviting students from other nations to live and play in Cameron Park, the club has reached out to countries around the globe to provide service as well. Working with their “sister” club in Uruapan, Mexico, providing our southern neighbors with furnishings and other assistance has been an important element to the dedicated bunch. Helping introduce Rotary to Eastern Russia has been an important parts of the group’s service as well. On a local level, the Rotary Club of Cameron Park has been involved with developing and improving local parks, furnishing day care centers and providing academic scholarship awards to local high school students. The club recently co-hosted their annual event, Wine at Town Center, with the Rotary Club of El Dorado Hills, which successfully raised funds for continuing service projects. Pollock Pines-Camino Rotary is a small group. 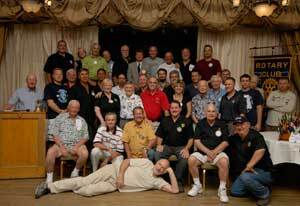 With fewer than 20 members, the 61-year old club manages to pack a lot of service into their program. Recent activities include a Music and Speech contest for high school students, and two scholarships for graduating seniors at El Dorado High School. A recent Rotarians at Work Day had members cleaning a culvert at Sanders Drive and Pony Express, as well as cleaning other areas of Pony Express Trail. Rotary members especially enjoy their 20-year tradition of helping with the El Dorado Spelling Bee, and holding their monthly Community Flea Market. The club recently hosted a Chili Challenge fundraiser, and is working on their annual school benefit fundraiser, Evening in the Orchard, that will be held September 16. They will also host a community Halloween party in October. The Rotary Club of Placerville has about 50 members, and enjoys sponsoring students from various countries in a Youth Exchange program as well. This year, they look forward to meeting and hosting a girl from Chile. The group recently co-hosted their Chili Challenge fundraiser with Pollock Pines-Camino Rotary, purchased a new wrestling mat for El Dorado High School and participated in the Rotary at Work Day, cleaning and beautifying local areas.